A memo on the break-up of Roma camps may breach international human rights laws, say critics of expulsions Claims by the French government that it is not targeting Roma camps for destruction and deportations have been challenged by a leaked document suggesting police are following president Nicolas Sarkozy’s orders. Critics of the controversial expulsions are examining the internal memo to establish whether it breaks international human rights laws on discrimination. The order, circulated to police chiefs last month as France began expelling nearly 1000 Roma Gypsies to Romania and Bulgaria, appeared to confirm the ethnic minority was being singled out. It comes as an embarrassment to immigration minister Eric Besson who, just a few days ago, said sending police to destroy camps and settlements set up by travellers from Romania and Bulgaria and ordering inhabitants to leave France was not aimed at the Roma. He insisted they were being treated no differently to other European Union migrants who do not meet France’s residency rules. « France has not taken any measure specifically against the Roma [who] are not considered as such but as natives of the country whose nationality they have, » he said. 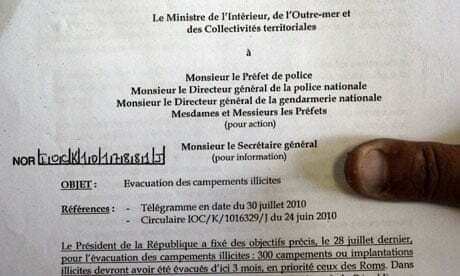 However, a leaked memo, dated 5 August 2010, and signed by the chief of staff for interior minister Brice Hortefeux, reminds French officials of a « specific objective » set out by Sarkozy. Besson told France 2 state television that he was not aware of the leaked circular: « I wasn’t a recipient, and therefore I didn’t need to know about it, » he said. The document has sparked furious reactions from the opposition and critics of the expulsions. The Group for Information and Support for Immigrants (Gisti) says it is examining the memo to establish if it breaks any criminal laws. « Can you imagine a circular specifically naming Jews or Arabs? » said Stephane Maugendre, a lawyer and president of Gisti. The Socialist party has also questioned whether the document is legal and said it smacked of « xenophobic policy ». « I ask the European commission and its president José Manuel Barroso to initiate infringement proceedings against the French government to end the indignity and stigma unacceptable to the European citizens that are Roma, » said Harlem Désir, a French Socialist MEP. France has vowed to continue the Roma deportations despite vehement criticism at home and from the EU and United Nations. Last Thursday the European parliament passed a resolution by 337 votes to 245 calling on Paris to « immediately suspend all expulsions of Roma », saying the policy « amounted to discrimination ». The MEPs admitted their demands were not legally binding but pointed out that mass expulsions are prohibited under EU law « since they amount to discrimination on the basis of race and ethnicity ». Belgian MEP Guy Verhofstadt, a former prime minister, said it was unacceptable for politicians to be « tempted by populist, racist and xenophobic policies ». The French authorities appear determined and defiant in the face of such international condemnation. Today officials in Marseille announced more than 100 Roma would be flown back to their home countries tomorrow having accepted €300 to return.